It is surrounded by some of the biggest attractions of Switzerland, if not to say of the Alps: Blatten, the little mountain village with its earthy brown huts, hosts the entrance to Massaschlucht, the Swiss Grand Canyon, indeed. Also, it is the gate to Europe’s most famous glacier. With 23 kilometres of length and an estimated weight of 27 billion tons, the Aletschgletscher is a phenomenon in the glacial world. 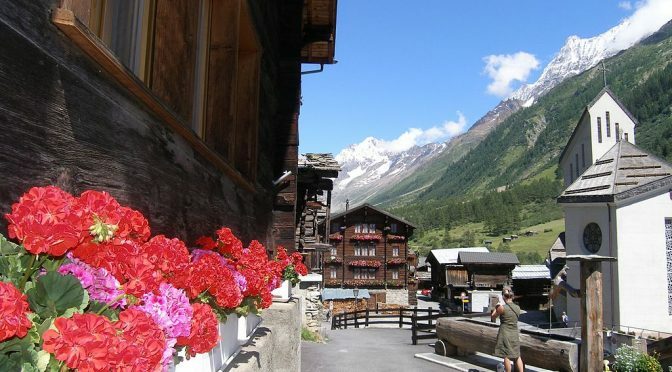 Sunny Belalp, a high plateau and one of the nine skiing resorts in the canton Valais, is situated there, too. During wintertime, the picturesque little village adjacent to it lures skiers, snowboarders and toboggan fans into its chalets. They can prove their skills on up to 60 km long slopes or enjoy themselves on the seven km long toboggan run close by. The ski tunnel Hostock is an additional treat. But it is also its family-friendliness that Blatten is famous for. Children will forget everything else when they discover the pleasures of the mountain world. During summertime, they can join wildlife watching tours or learn how to climb in a playful way. They may swim, do handicrafts, paint T-Shirts or visit Flip, the so-called glacial flee. Older ones can wander barefooted along the Hexen-Kneipp-Pfad (witches’ path) or test their courage, concentration, and coordination skills in the rope-parcour. Another fun attraction, also for adults, is the rental of Trotti-Bikes. The peculiar mixture between a mountain bike and a saddle less roller is rather popular and provides for a velocious journey downhill. Why not conquer Belalp’s car-free plateau with the longest Swiss chairlift first and then make it back on such a “velo de plaisir”? Above all, Blatten-Belalp – it should not be mixed up with Blatten in Lötschertal – distinguishes itself by the gorgeous nature unfolding there. If you dwell on the thought of snowy white peaks in front of intensive blue skies, of rugged canyons and valleys saturated with Green, you will understand the popularity of the place. However, it was the fact that its ecological variety includes seldom species, too, which made it become part of the UNESCO Natural Heritage of the World.